Small volumes of CSTA recombinant protein vial(s) may occasionally become entrapped in the seal of the product vial during shipment and storage. If necessary, briefly centrifuge the vial on a tabletop centrifuge to dislodge any liquid in the container`s cap. Certain products may require to ship with dry ice and additional dry ice fee may apply. 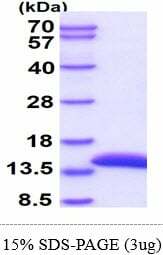 CSTA, also known as Stefin A, is thiol protease inhibitors that form complexes with papain and the cathepsins B, H and L. The protein is one of the precursor proteins of the cornified cell envelope in keratinocytes and plays a role in epidermal development and maintenance. CSTA is thought to be a tumor suppressor, since an inverse correlation seems to exist between the level of CSTA and tumor progression, in several malignancies Recombinant human CSTA protein, fused to His-tag at N-terminus, was expressed in E Coli and purified by using conventional chromatography techniques. NCBI/Uniprot data below describe general gene information for CSTA. It may not necessarily be applicable to this product. Takai T., et al. (2009) J Immunol. 183 (12):7958-65.; Sinha AA., et al. (2008) Anticancer Res. 28 (4B):2271-7. 1. Identify myoepithelial cell stefin A as a suppressor of early tumor invasion and a candidate marker to distinguish patients who are at low risk of developing invasive breast cancer.